While quick to express solidarity with the victims of Sunday's terror attack, the Council on American-Islamic Relations has long ignored Muslim American LGBT activists. The Council on American-Islamic Relations (CAIR) has touched the hearts of many journalists since an ISIS-inspired terror attack left 49 dead at a gay nightclub in Orlando early Sunday morning. CAIR Executive Director Nihad Awad called for solidarity with "all communities who are the victims of violence and persecution in our country." CAIR-San Francisco Director Zahra Billoo vowed to "stand with the LGBT community against homophobic violence." The head of the organization's Florida chapter, Hassan Shibly, declared his "overwhelming love and support and unity" for the LGBT community. In light of Islam's well-known prohibitions against homosexuality, it's great to hear such words in any context. But let's not kid ourselves. CAIR was founded by members of the Sunni Islamist Muslim Brotherhood, whose hatred of homosexuals is quite explicit. Shibly himself decried homosexuality as "evil" and a "quick way to earn God's wrath" in a 2009 Facebook essay on gay marriage. Most CAIR officials have avoided expressing anti-LGBT opinions publicly. In order not to jeopardize their pursuit of U.S. governmental access and partnerships with left wing anti-Israel activists, most CAIR officials have avoided expressing such opinions publicly. More often they have ignored the issue of homosexuality or denied that it is prevalent in the Muslim community. Echoing the laughable claims of former Iranian president Mahmoud Ahmadinejad that his country has no homosexuals, CAIR-Chicago director Ahmed Rehab once objected to the presence of a gay Muslim American character in a local theater production, saying that homosexuality is an issue "not...very prevalent in the Muslim community" that was "imposed upon it by the play makers." 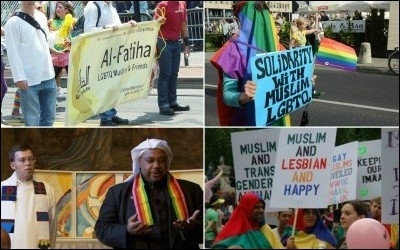 Moreover, CAIR coordinates very closely with other Islamist organizations that have not felt the need to bite their tongues when talking about homosexuality. Tahirah Amatul Wadud, a member of the CAIR-Massachusetts Executive Board of Directors, also happens to be general counsel for the notoriously anti-gay organization The Muslims of America Inc. (TMOA), led by Mubarak Ali Gilani (for high-profile cases handled at TMOA by Wadud, see here and here). Gilani called the U.S. Supreme Court's legalization of gay marriage on June 26, 2015 "a black day in the history of mankind." CAIR frequently hosts Muslim preachers known for virulent anti-gay rhetoric. CAIR frequently hosts events featuring Muslim preachers known for virulent anti-gay rhetoric. A frequent speaker at CAIR fundraisers, Siraj Wahhaj, famously threatened to burn down a proposed LGBT-friendly mosque in Toronto in 1992. Suhaib Webb, another favorite of CAIR events, called homosexuality an "evil inclination" in 2007. Omar Suleiman, who has recorded numerous promotional videos for CAIR, has called homosexuality a "disease" and a "repugnant, shameless sin." Islamic Shura Council of Southern California leader Muzammil Siddiqi, with whom CAIR held a joint press conference following the December 2015 San Bernardino terror attack, has advocated the death penalty for homosexuals in Muslim countries. In short, CAIR has done nothing to stand up for the rights of LGBT Americans or promote more tolerant Muslim-American attitudes toward sexual orientation, while giving radical Islamist preachers on whom it depends for support a platform for anti-gay incitement. CAIR's sudden expressions of affinity for the LGBT community are nothing more than damage control, designed to obscure its role in propagating the murderous ideology that led Orlando shooter Omar Mateen on his rampage. Fancy PR footwork aside, CAIR is part of the problem, not part of the solution.